This kids soccer drill is called 'Mirror Image'. Kids Soccer - Mirror Image! 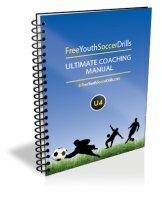 This kids soccer drill is really simple but lots of fun. It is very good as a warm up game at the beginning of the session. Take a look at the diagram below for Mirror Image. It's really easy, you just need the players to get into pairs without a soccer ball to begin with and line up opposite each other with cones to their left and right. This kids soccer drill is all about movement. The players stand opposite each other and decide who will take the lead first. On coaches command, the player taking the lead will run toward one of the cones. The other player, must try and beat them their. After they are both at the cone, they should both return to the middle again. In a game situation, the player making the move would be trying to lose an opponent off of the ball and the other player would be trying to mark as a defender. After a few goes, switch which player takes the lead. There are plenty of progressions to this drill as shown below and all ages can benefit fron this soccer drill. The first obvious progression to this drill is to involve a soccer ball for each player. Exactly the same drill but this time they must dribble to one cone whilst maintaining close control. The next progression is for the player chasing to run or dribble with ball to the opposite cone. This will get them thinking and exercising their mind as well as their bodies. Another progression to include is adding a third cone behind both players. The player who makes the first move can then decide to run backwards pushing off on their toes until they reach the cone. -> Make sure the kids use little touches on the ball and demonstrate at every new coaching point. Leave this kids soccer drill - See more U7 drills!